With history dating back to 1955, the first Red Dot Museum thrives in the historic Zollverein Coal Mine Industrial Complex in Essen, Germany. The Singapore and Essen museums display winners of the International Red Dot Design Award and comprise the world’s largest exhibition of contemporary design. Although the two museums are intricately related, a 12 hour flight between the two cities creates the feeling of a large gap. 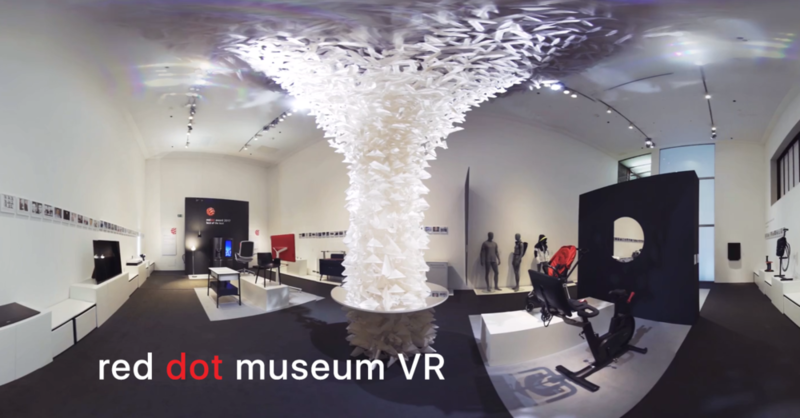 To bridge the gap, Vostok VR conceptualized a 360-degree movie experience that virtually takes museum visitors in Singapore to Essen. In place of narration, the tour uses a poem by Singaporean poet and artist Marc Nair to describe the museum. This was an innovative choice used to echo the feel of the museum and complement the use of virtual reality. A fully autonomous version of the experience allows viewer to launch the VR. However, a dedicated video-booth at the museum for the virtual reality tour minimizes the number of staff required to operate the installation. Film production was done in Essen, Germany in 3 days by Vostok VR. The 360-video production crew captured a true to size model of a Cavalon ultra-light gyroplane, a full aluminum coachwork of an Audi A8 hanging from the ceiling, and a 7-meter-high sculpture made of 6000 sheets of paper known as Communication+ Tree. The shots and frames were so meticulously taken that the project included hiring an expert to safely shoot from inaccessible and dangerous areas of the building. The experience features Oculus Rift virtual reality headsets and is currently one of the most prominent experiences in the museum. Between 10 thousand people were virtually transported 10,000 kilometers through the 360-degree videos in 2018. As Vostok VR brings 360 video production mainstreams, more museums are expected to consider its use.